Second Life is a 'closed', self-contained, commercial grid -- the über-grid which, whilst not connected to the OpenSim metaverse itself, seeded the concept and provided the technology to create it. When the Second Life client was made open-source in January 2007,1 the resulting OpenSimulator project produced, in time, the OpenSim metaverse -- a vast digital universe of hundreds (possibly thousands!) 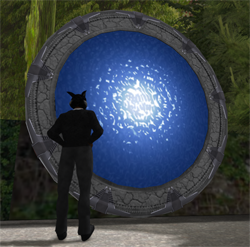 of grids or worlds, many of which are interconnected through an interworld teleport system called the hypergrid. The Tortoise, a Second Life resident, visited the OpenSim metaverse for the first time last month, and discovered that Second Life and OpenSim worlds have some important differences, especially for new visitors from SL. Here are 8 ways in which OpenSim worlds differ from SL. 1. You Enter the Metaverse through One World. To make your way into the OpenSim metaverse, you must first register your avatar with any OpenSim world with an open registration, through their website. That world becomes your 'home world', or home grid. From that point, you enter the metaverse through this world, and once inworld, you can teleport or 'jump' to other worlds on the hypergrid. If you log out whilst away from your homeworld, your next login will find you back in your homeworld. Note: If you will want to hypergrid to other worlds, make sure the grid you are registering to is Hypergrid-enabled. 2. Trash Must Be Emptied Through the World/Grid's Website. 3. Your Inventory Can Be Lost. Because your inventory is not retained on the grid operator's server,4 its safety may be precarious. If your homegrid/world crashes or breaks, your inventory may be lost, since what is stored on your computer cannot be translated back into usable inventory without a prior coding process. This coding process, unfortunately, is somewhat complicated and requires you to actually own a region. If you do, then you can access the 'OpenSim server console' and create backup files called IARs or OARs. These IARs or OARs can then be converted back into usable inventory. 4. You Can Back Up Your Inventory Without Owning Land. This is a rough workaround for any landless avatar. You can register two or three more avatars at different worlds, under the same name if you wish, and transfer full-perm inventory and landmarks over to them. You then have a clone of yourself if your homeworld ever goes down. 5. You Must Give Items or Offer Friendship to Another Avatar While Both of You Are In the Same World. In the Tortoise's experience, neither process works properly if the avatars are standing in different worlds. Other users may have different experiences. In addition, it seems that friendship can sometimes only be offered to someone if you go TO the recipient's world to offer it. The Tortoise could be wrong! 6. The 'People' Option in the Search Window May Work Better with One-word Search Words. Type 'John' or 'Smith' when you search for John Smith, but not both words together. 7. The Search Window Can Only Find Avatars That Are Native to the Grid. If you go to Craftworld and search for 'John', only Craftworld's Johns will show up, not the other 500 from the rest of the OpenSim metaverse. 8. Maximum 5 Items Per Attachment Point. Only 5 items can be attached to the same Attachment Point on the avatar body (such as Skull or Left Foot). This is the case for many OpenSim worlds (as far as the Tortoise can tell), although the closed InWorldz grid, like Second Life, allows 38 items to be attached to the same body point if you wish. NOTE: A different list of Second Life and OpenSim differences was compiled by Maria Korolov of Hypergrid Business and is available here: Second Life vs. OpenSim. Hello iSkye, I wanted to point out that core Opensim has had multi attach points since March 2012. http://opensimulator.org/wiki/Avatarattachments. This was before inworldz added their own code for it. I like these articles and am sharing them around. Thank you. In fact, your inventory *is* stored on your home grid's main asset server even in open worlds It's not stored on your own computer. Many public grids -- particularly those with larger populations -- require you to use a web-page based method to empty your trash because the mechanism used to do so in-world is one that requires opening a "back door" through the server. Roughly, the grid server has no safe way of authenticating that it really is *you* who wants to empty your trash. That same back door also could potentially also be used to do considerably more harm, like wiping a user's entire inventory or even the entire grid's database... For obvious reasons, then, most grids don't open that back door but then this means that trash can only be emptied by logging into the grid's web service and initiating the request from there (which it *can* then authenticate and can also still protect everything else). There are smaller grids that don't do this, because the nature of the back door is such that it's only open to someone who hosts a region connected to that grid. If the grid doesn't allow self-hosting (and not all do) or if there's a very high level of trust for the people who do, the door can be left open and trash works just as it does in SL.